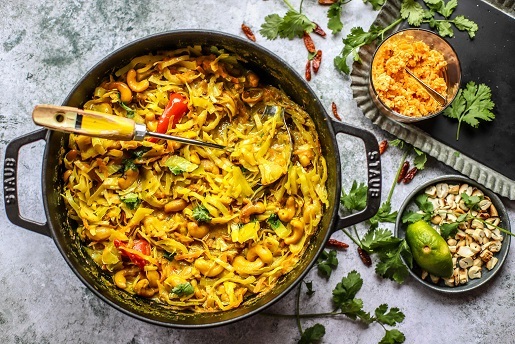 An easy-to-make, Sri Lankan-inspired mild curry of thinly sliced cabbage, toasted cashews, spices and coconut milk. A naturally vegan and whole food recipe. Sauté the onion in the coconut oil for five minutes, stirring. Add in the minced garlic, split chilli, mustard seeds, cumin seeds, curry leaves, fenugreek, turmeric, cinnamon, pepper and cashews. Sauté on a low heat for fifteen minutes, stirring occasionally. Pour in the coconut milk and water. Bring to a fast simmer and cook for 10 minutes without a lid. Add in the cabbage and carrots, stirring well. Add a lid (or cover with foil/baking tray if no lid) and simmer for eight minutes. Squeeze in the juice of one lime and stir. Serve with extra lime slices, and wholemeal flatbreads or brown basmati rice.